This was the observation of Bill Macaitis, CMO at Slack. 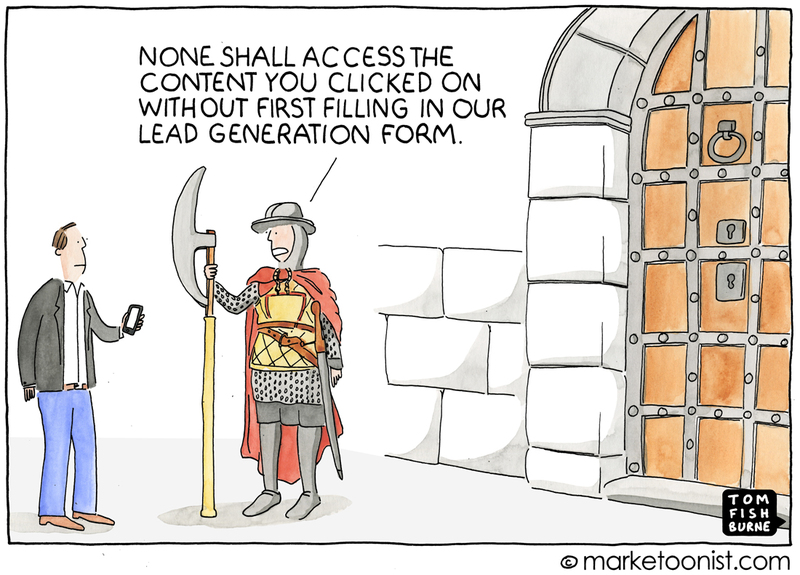 I think it captures how marketers can be too fixated on site visitors only as leads to be generated. They forget about the customer experience. They forget to deliver an experience worth generating a lead. According to Starfleet Media, companies gate 80% of major content marketing assets behind lead generation forms. I’ve read separately that companies lose 93% of visitors in paid search and social campaigns from gating content. Our content is how many of our potential customers meet our brands for the first time. How we welcome them that first time will determine if there’s a second time, and if we have the privilege to continue the relationship at all. 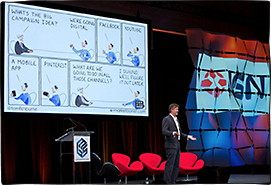 Scott Monty (former head of social at Ford) shared recently about clicking on a offer for “8 ultimate examples of omnichannel customer experiences.” He was immediately met with a lead generation form with a whopping 10 required fields, including “monthly ad spend”. That was the very first interaction he’d had with the company. Not surprisingly, it was also the last. Lead generation may be a business objective, but it’s just one step on the path to developing a relationship with customers. Many brands treat it like the first and only step. 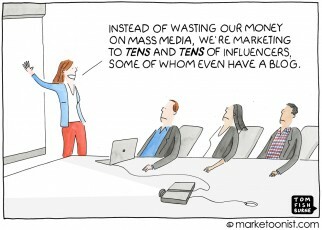 I think that audience cultivation should come before lead generation. If we’re cultivating an audience by building interest over time, leads will be the result. I no longer “fill out this form to get our report.” I don’t want the e-mails. I don’t want the phone calls. I’ve seen too many worthless “reports” to get fooled again. I’ve just read that you’d love to hear our thoughts. 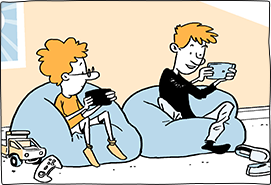 Why all your cartoons are “passive”? I mean, when are you planning to start creating GIF anim cartoons that could also express your viewpoints? Please sign this form an send it before Wikileaks reveals more H e-mails! Best regards from Caracas, Venezuela. As usual, you have nailed a real issue that many simply do not see as they ae blinded by the bull…. that seems to be accelerating with ‘moore-like’ ease. This is so true…I confess even I think like this! Thanks for the wakeup call. Yep, the customer experience is No. 1 and you should provide content worthy of their contact information. As for those companies that call leads straight after submitting, well so much for qualification process! Absolutely agree and it frustrates me no end. to counter this scourge I have a Junk email address, telephone numbers nearly always start with 123 and I have great fun randomly creating addresses and fake names. Despite the obvious fakery I still get emails to the junk email address – so as a lead generation activity it is clearly flawed as no-one is cleaning the list or passing on the list they are using is to collect emails to spam me. I work in B2B and a smaller target market – yet still somehow the marketing teams apply retail lead generation tactics to a market that functions on relationships. 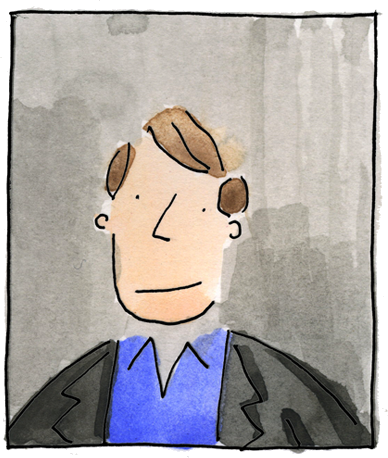 I like how you said that marketers sometimes forget about the customer experience Tom! 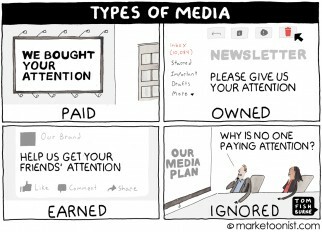 That hey forget to deliver an experience worth generating a lead, cause that’s true! Completely agree, I just fill in fake details with a disposable email most of the time (if it won’t send you directly the PDF) because I get fed up of being hounded by sales people at work. Not once have I purchased a service off the back of someone chasing me post I’ve downloaded some content. If I like the look of what they have to offer, I’ll go to them. I agree with you but this depends on multiple factors. Two important factors are the products/services & the user intent. Say I’m searching a topic around content marketing and I landed on a page that is partially explaining the topic and sheds some good info, however if I would like to know more I’ll have to give out my email in exchange for their “content marketing guide ” which I will do if the snackable intro and the landing page were good enough for me to opt in. Many sites out there do it properly, segmenting their lists and only sending related materials to the right segments .